Property 27: Crignes apartment a short walk from the center of Cortina, overlooking the Faloria. 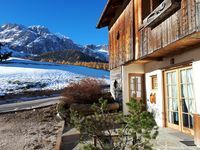 Property 30: Cortina, 10' walk to town, ski-in ski-out, unbelievable view, romantic attic with fireplace: really a nice place to live! Property 43: Tyrolean-style apartment with a wooden furnished stube.